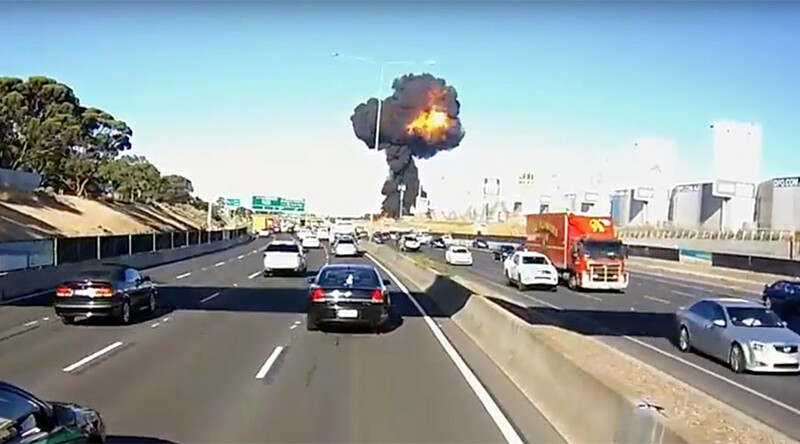 The moment a charter plane plummeted into a shopping mall in Melbourne was captured by a dashboard camera from a car approaching the crash site. The plane can be seen descending onto the Direct Factory Outlet shopping mall. All five people onboard died in the crash, described as “the worst civil aviation accident that our state has seen for 30 years” by Victoria Prime Minister Daniel Andrews. Another dashcam video shows the crashed plane erupting into a huge ball of flames. The Beechcraft B200 King Air aircraft took off from Essendon airport, a small airfield mainly used by light planes, at around 8:30am for King Island. Quatermain, who had 38 years’ flying experience, was the subject of an 18-month investigation by the Australian Transport Safety Bureau (ATSB) following a “near collision” with another plane in September 2015, The Age reports.